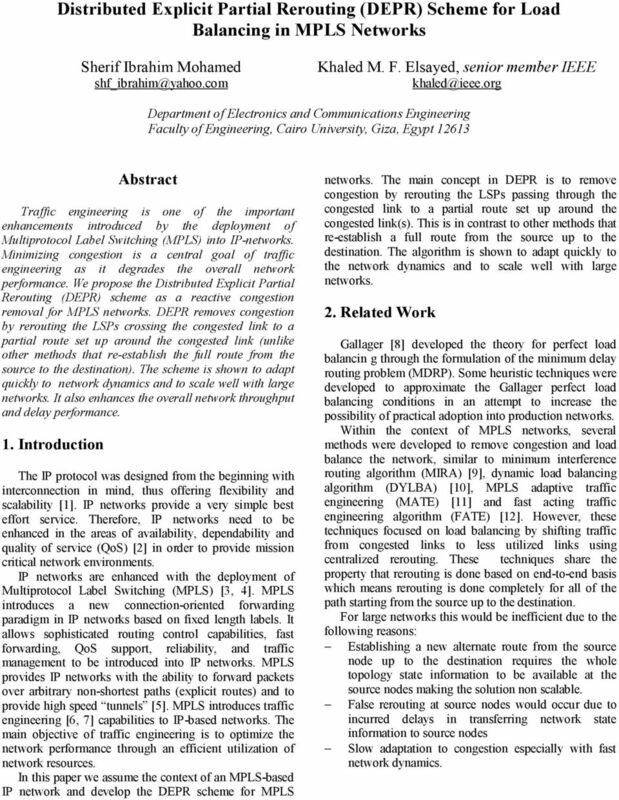 Download "Distributed Explicit Partial Rerouting (DEPR) Scheme for Load Balancing in MPLS Networks"
1 Distributed Eplicit Partial Rerouting (DEPR) Scheme for Load Balancing in MPLS Networks Sherif Ibrahim Mohamed Khaled M. F. Elsayed, senior member IEEE Department of Electronics and Communications Engineering Faculty of Engineering, Cairo University, Giza, Egypt Abstract Traffic engineering is one of the important enhancements introduced by the deployment of Multiprotocol Label Switching (MPLS) into IP-networks. Minimizing congestion is a central goal of traffic engineering as it degrades the overall network performance. We propose the Distributed Eplicit Partial Rerouting (DEPR) scheme as a reactive congestion removal for MPLS networks. DEPR removes congestion by rerouting the LSPs crossing the congested link to a partial route set up around the congested link (unlike other methods that re-establish the full route from the source to the destination). The scheme is shown to adapt quickly to network dynamics and to scale well with large networks. It also enhances the overall network throughput and delay performance. 1. Introduction The IP protocol was designed from the beginning with interconnection in mind, thus offering fleibility and scalability . IP networks provide a very simple best effort service. Therefore, IP networks need to be enhanced in the areas of availability, dependability and quality of service (QoS)  in order to provide mission critical network environments. IP networks are enhanced with the deployment of Multiprotocol Label Switching (MPLS) [3, 4]. MPLS introduces a new connection-oriented forwarding paradigm in IP networks based on fied length labels. It allows sophisticated routing control capabilities, fast forwarding, QoS support, reliability, and traffic management to be introduced into IP networks. MPLS provides IP networks with the ability to forward packets over arbitrary non-shortest paths (eplicit routes) and to provide high speed tunnels . MPLS introduces traffic engineering [6, 7] capabilities to IP-based networks. The main objective of traffic engineering is to optimize the network performance through an efficient utilization of network resources. 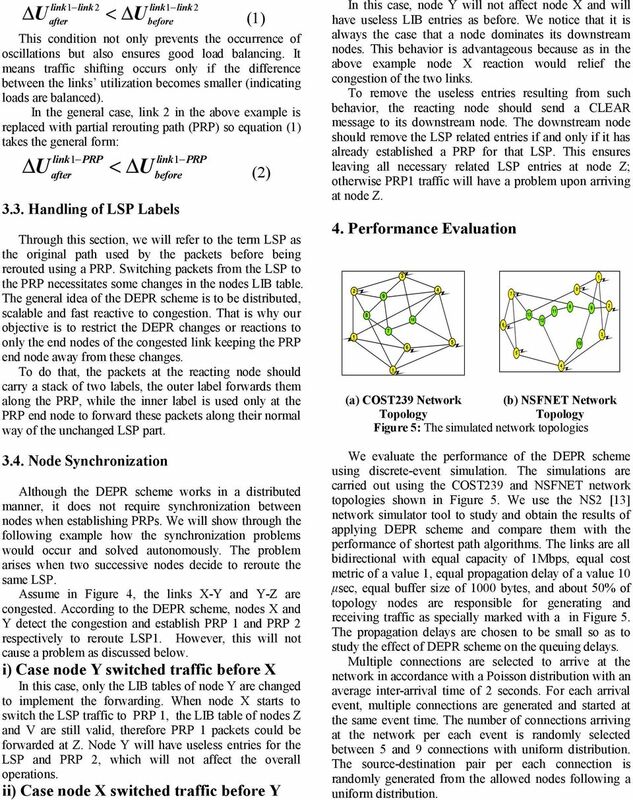 In this paper we assume the contet of an MPLS-based IP network and develop the DEPR scheme for MPLS networks. The main concept in DEPR is to remove congestion by rerouting the LSPs passing through the congested link to a partial route set up around the congested link(s). This is in contrast to other methods that re-establish a full route from the source up to the destination. The algorithm is shown to adapt quickly to the network dynamics and to scale well with large networks. 2. Related Work Gallager  developed the theory for perfect load balancin g through the formulation of the minimum delay routing problem (MDRP). Some heuristic techniques were developed to approimate the Gallager perfect load balancing conditions in an attempt to increase the possibility of practical adoption into production networks. 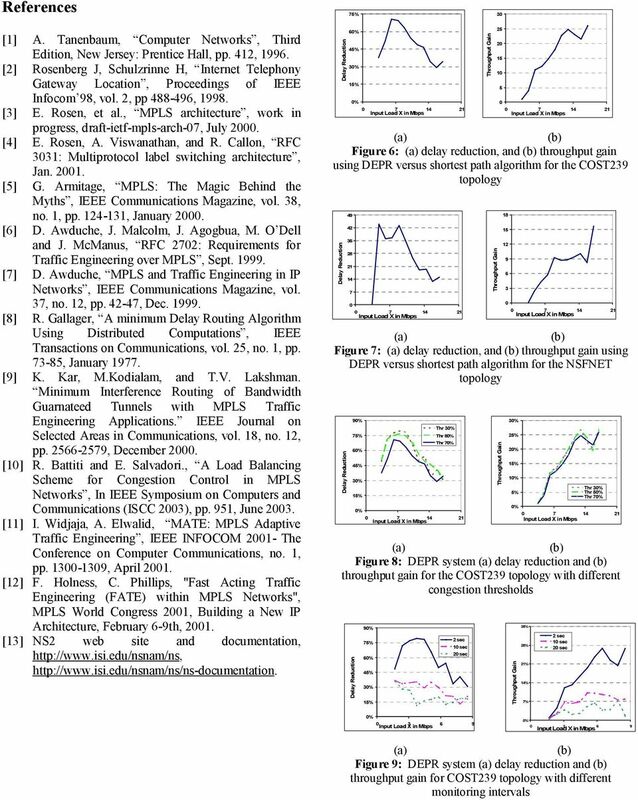 Within the contet of MPLS networks, several methods were developed to remove congestion and load balance the network, similar to minimum interference routing algorithm (MIRA) , dynamic load balancing algorithm (DYLBA) , MPLS adaptive traffic engineering (MATE)  and fast acting traffic engineering algorithm (FATE) . However, these techniques focused on load balancing by shifting traffic from congested links to less utilized links using centralized rerouting. These techniques share the property that rerouting is done based on end-to-end basis which means rerouting is done completely for all of the path starting from the source up to the destination. For large networks this would be inefficient due to the following reasons: Establishing a new alternate route from the source node up to the destination requires the whole topology state information to be available at the source nodes making the solution non scalable. False rerouting at source nodes would occur due to incurred delays in transferring network state information to source nodes Slow adaptation to congestion especially with fast network dynamics. 4 U < U (1) link1 link2 link1 link 2 after before This condition not only prevents the occurrence of oscillations but also ensures good load balancing. It means traffic shifting occurs only if the difference between the links utilization becomes smaller (indicating loads are balanced). In the general case, link 2 in the above eample is replaced with partial rerouting path (PRP) so equation (1) takes the general form: link1 PRP link1 PRP U < U after before (2) 3.3. Handling of LSP Labels Through this section, we will refer to the term LSP as the original path used by the packets before being rerouted using a PRP. Switching packets from the LSP to the PRP necessitates some changes in the nodes LIB table. The general idea of the DEPR scheme is to be distributed, scalable and fast reactive to congestion. That is why our objective is to restrict the DEPR changes or reactions to only the end nodes of the congested link keeping the PRP end node away from these changes. To do that, the packets at the reacting node should carry a stack of two labels, the outer label forwards them along the PRP, while the inner label is used only at the PRP end node to forward these packets along their normal way of the unchanged LSP part Node Synchronization Although the DEPR scheme works in a distributed manner, it does not require synchronization between nodes when establishing PRPs. We will show through the following eample how the synchronization problems would occur and solved autonomously. The problem arises when two successive nodes decide to reroute the same LSP. Assume in Figure 4, the links X-Y and Y-Z are congested. According to the DEPR scheme, nodes X and Y detect the congestion and establish PRP 1 and PRP 2 respectively to reroute LSP1. However, this will not cause a problem as discussed below. i) Case node Y switched traffic before X In this case, only the LIB tables of node Y are changed to implement the forwarding. When node X starts to switch the LSP traffic to PRP 1, the LIB table of nodes Z and V are still valid, therefore PRP 1 packets could be forwarded at Z. Node Y will have useless entries for the LSP and PRP 2, which will not affect the overall operations. ii) Case node X switched traffic before Y In this case, node Y will not affect node X and will have useless LIB entries as before. We notice that it is always the case that a node dominates its downstream nodes. This behavior is advantageous because as in the above eample node X reaction would relief the congestion of the two links. To remove the useless entries resulting from such behavior, the reacting node should send a CLEAR message to its downstream node. The downstream node should remove the LSP related entries if and only if it has already established a PRP for that LSP. This ensures leaving all necessary related LSP entries at node Z; otherwise PRP1 traffic will have a problem upon arriving at node Z. 4. Performance Evaluation COST239 Network NSFNET Network Topology Topology Figure 5: The simulated network topologies We evaluate the performance of the DEPR scheme using discrete-event simulation. The simulations are carried out using the COST239 and NSFNET network topologies shown in Figure 5. We use the NS2  network simulator tool to study and obtain the results of applying DEPR scheme and compare them with the performance of shortest path algorithms. The links are all bidirectional with equal capacity of 1Mbps, equal cost metric of a value 1, equal propagation delay of a value 10 μsec, equal buffer size of 1000 bytes, and about 5 of topology nodes are responsible for generating and receiving traffic as specially marked with a in Figure 5. The propagation delays are chosen to be small so as to study the effect of DEPR scheme on the queuing delays. Multiple connections are selected to arrive at the network in accordance with a Poisson distribution with an average inter-arrival time of 2 seconds. For each arrival event, multiple connections are generated and started at the same event time. The number of connections arriving at the network per each event is randomly selected between 5 and 9 connections with uniform distribution. The source-destination pair per each connection is randomly generated from the allowed nodes following a uniform distribution. 5 Each connection lasts for a certain time uniformly distributed between (15, 20) sec. The traffic type of the connections is UDP traffic with an average rate that is uniformly distributed in between (90, 180) kbps. Each connection traffic pattern follows a Pareto distribution with a mean burst time of 0.5 sec, a mean idle time of 0.05 sec, and a packet size of 200 bytes. During the simulation the congestion threshold is set to be 7. To evaluate the efficiency of the delay enhancement due to using DEPR compared to the shortest path algorithms, equation (3) is used. sh DEPR D D D λ = (3) sh D D where, is the network input load in Mbps, λ is DEPR sh system delay efficiency at network input load, D is system delay using shortest path algorithms at input load, and D is system delay using DEPR scheme at input DEPR load. To evaluate the DEPR gain with respect to system throughput compared to the shortest path algorithms, equation (4) is used. DEPR sh ω ω ω λ = (4) ω where, λ is DEPR system throughput efficiency at sh network input load, ω is system throughput using DEPR shortest path algorithms at input load, and ω is system throughput using DEPR scheme at input load. Figures [6-, 7-] illustrate the DEPR system delay reduction percentage with respect to COST239 and NSFNET topologies at different input loads. For the COST239 topology, it ranges between 3 and 7 and for the NSFNET topology it ranges between and 45%. It is evident that there is a good enhancement in the overall system delay when using DEPR scheme. It is cleat that the COST239 results are better than in the NSFNET since the former topology is more connected. Figures [6-, 7-] plot the DEPR throughput gain percentage with respect to both COST239 and NSFNET topologies at different input loads, where it reaches 24% at higher loads for COST239 topology and for the NSFNET topology. 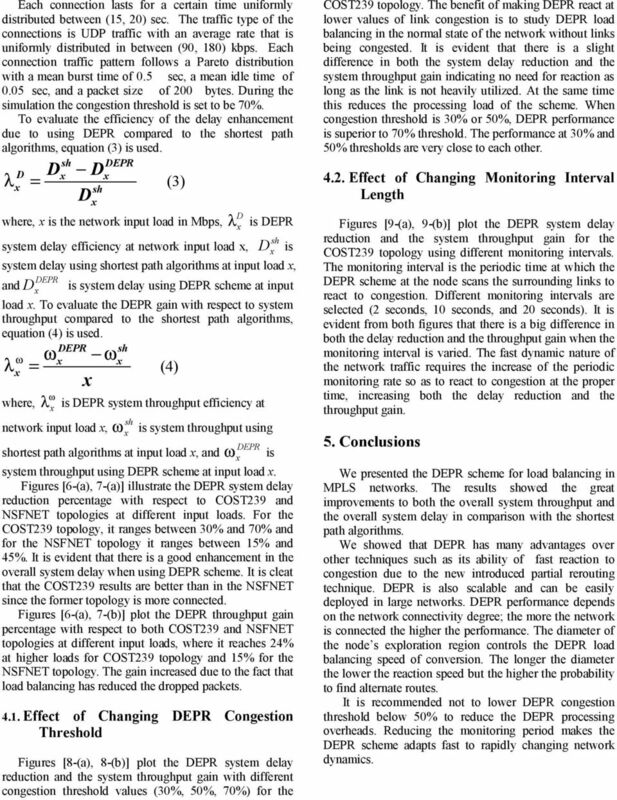 The gain increased due to the fact that load balancing has reduced the dropped packets Effect of Changing DEPR Congestion Threshold Figures [8-, 8-] plot the DEPR system delay reduction and the system throughput gain with different congestion threshold values (3, 5, 7) for the COST239 topology. The benefit of making DEPR react at lower values of link congestion is to study DEPR load balancing in the normal state of the network without links being congested. It is evident that there is a slight difference in both the system delay reduction and the system throughput gain indicating no need for reaction as long as the link is not heavily utilized. At the same time this reduces the processing load of the scheme. When congestion threshold is 3 or 5, DEPR performance is superior to 7 threshold. The performance at 3 and 5 thresholds are very close to each other Effect of Changing Monitoring Interval Length Figures [9-, 9-] plot the DEPR system delay reduction and the system throughput gain for the COST239 topology using different monitoring intervals. The monitoring interval is the periodic time at which the DEPR scheme at the node scans the surrounding links to react to congestion. Different monitoring intervals are selected (2 seconds, 10 seconds, and 20 seconds). It is evident from both figures that there is a big difference in both the delay reduction and the throughput gain when the monitoring interval is varied. The fast dynamic nature of the network traffic requires the increase of the periodic monitoring rate so as to react to congestion at the proper time, increasing both the delay reduction and the throughput gain. 5. Conclusions We presented the DEPR scheme for load balancing in MPLS networks. The results showed the great improvements to both the overall system throughput and the overall system delay in comparison with the shortest path algorithms. We showed that DEPR has many advantages over other techniques such as its ability of fast reaction to congestion due to the new introduced partial rerouting technique. DEPR is also scalable and can be easily deployed in large networks. DEPR performance depends on the network connectivity degree; the more the network is connected the higher the performance. The diameter of the node s eploration region controls the DEPR load balancing speed of conversion. The longer the diameter the lower the reaction speed but the higher the probability to find alternate routes. It is recommended not to lower DEPR congestion threshold below 5 to reduce the DEPR processing overheads. Reducing the monitoring period makes the DEPR scheme adapts fast to rapidly changing network dynamics.